Microscopically, plexiform neurofibromas (PF) consist of thickened nerve branches that appear tortuous as they are sectioned in various planes. There is increased amount of myxoid matrix in the endoneurium. The external perineurial layer is preserved giving an encapsulated appearance to individual nodules. The cellular composition is similar to that seen in localized neurofibromas. 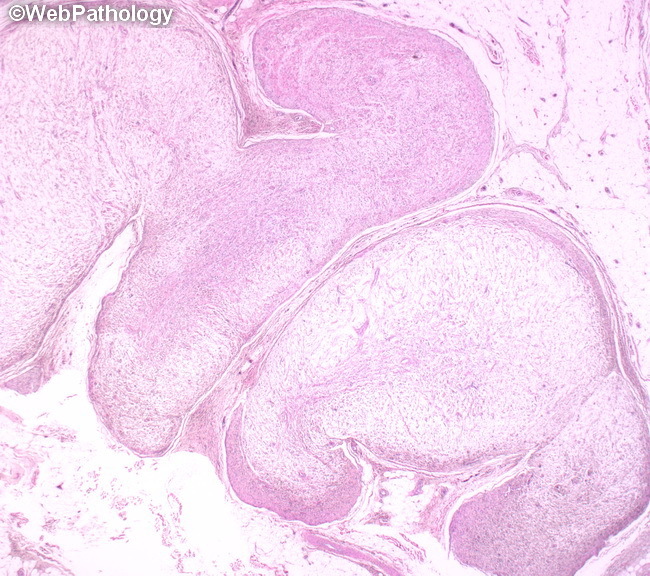 In long-standing lesions, Schwann cells may grow into the surrounding soft tissue creating diffuse neurofibromas. PF may display increased cellularity as well as nuclear atypia. Such lesions are at a greater risk of malignant transformation.